Developer Christopher E. from France has released a new version of his TECNativeMap component for Delphi XE8 Firemonkey. TECNativeMap is a 100% Object Pascal mapping component with offline support for all Firemonkey platforms (Android, IOS, OSX, and Windows). 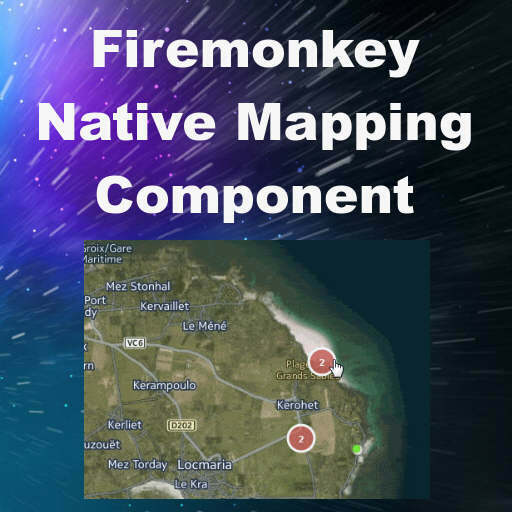 A lot of the other mapping components for Firemonkey use either a browser window which requires an internet connection or the native platform map which may or may not support offline viewing. In addition to offline viewing TECNativeMap also supports using your own map tile server (with high resolution tiles at 512×512) which makes it very customization. Other map tile servers supported are OpenStreetMap maps, Bing, MapQuest, CloudMade, OpenCycleMap and OPNV. You can import and export mapping data to KML, GeoJSON, GPX, and text formats. It supports shapes with different animated options including TECAnimationShapeColor , TECAnimationMarkerFilename, TECAnimationFadePoi, TECAnimationDrawPath, TECAnimationMoveToDirection and TECAnimationMarkerZoomFilename. Additionally it has a tie in to the MapQuest Xapi Service API for geolocating place data. Routing and directions are supported through integration with OpenStreetMaps. Multiple map views, a minimap, zoom, rotation, and layers containing labels and graphics are all supported as well. As you can see there is a massive amount of features in this commercial mapping component. It looks like a free trial is available on request and there are also device specific demos you can download and test out. Source code is included with purchase and Appmethod is probably also supported. The price is pretty amazing for all of the functionality that it has. Head over and check out the full feature set of this native offline capable mapping component for Delphi XE8 Firemonkey.